New England Patriots Helmet 1982-89 Throwback Pro Line - Login for SALE Price | Sports Memorabilia! 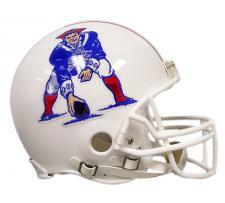 New England Patriots Helmet - 1982-89 Throwback Pro Line Helmet by Riddell. The New England Patriots wore this helmet on the field from 1982-89 with a white facemask. This officially licensed Riddell Pro Line Helmet is just like the players wore. The Pro Line features a Kra-Lite II Polycarbonate Lexon shell, an inflatable liner with two inflation points; a steel polyvinyl-coated quarterback-running back style facemask and four point chin-straps. Pro Lines come in official colors and logos.